Chromecast Ultra is the new a media streaming device Google has announced that plugs into the HDMI port on your TV. Simply use your mobile device and the TV you already own to stream your favorite TV shows, movies, music, sports, games and more. Chromecast Ultra supports to stream in up to 4K Ultra HD and HDR with stunning picture and lightning speed. But Chromecast Ultra doesn’t support any 4K video format. For example, Chromecast Ultra doesn’t support MKV. 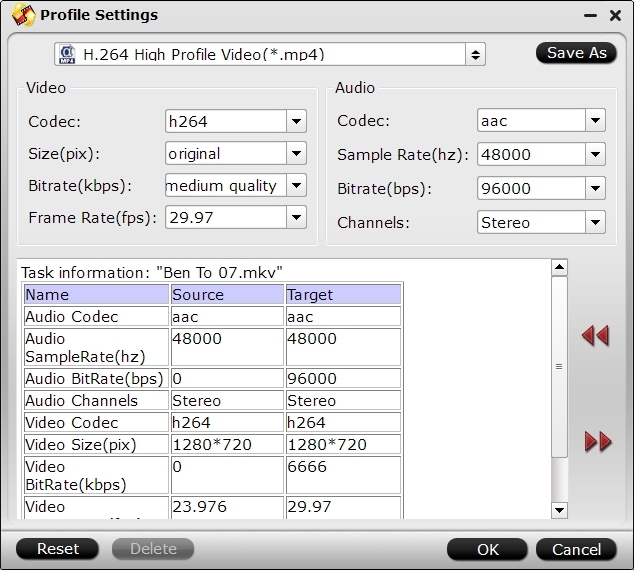 As many known, MKV, as a media container, can cantian multiple video and audio codecs, which often makes its playback harder on some multimedia devices such as Chromecast Ultra, Xbox One S, Sony XD93, etc. Normally, if you want to cast MKV files to TV with Chromecast Ultra, you can use Plex to stream MKV files. Plex will transcode MKV to Chromecast Ultra supported format but it will consume a lot of CPU capacities to do so and it will hold up the media streaming of Chromecast Ultra. To stream MKV with Chromecast Ultra without CPU-taking of MKV decoding/trancoding online, the best way is transcoding MKV files to Chromecast Ultra best compatible file formats as below before performing the video streaming process. WebM – .webm video encoded with VP8 video codec and Vorbis audio codec. As the best MKV Converter, here Pavtube Video Converter Ultimate for Windows/Mac are stronly recommended. This program can convert DivX MKV, XviD MKV, H.264 MKV, H.265 MKV to MP4 for Chromecast Ultra streaming. It can compress 4K MKV to 1080p video and upscale HD MKV to 2160p video. It can hard burn external subtitles to MKV files and replace/remove audio in/from MKV video. Besides MKV, it also can convert AVI, TS, ISO, VOB, MXF, AVCHD, WMV and even Blu-ray and DVD to Chromecast Ultra and Chromecast 2/1. It says Chromecast Ultra will be added to support for HEVC codec to compress 4K video size and save bandwidth. If you can play HEVC with Chromecast Ultra, you can use Pavtube Video Converter Ultimate to convert MKV to HEVC MP4 for Chromecast and even can rip Blu-ray, DVD, 4K Blu-ray to HEVC MP4 for Chromecast Ultra. In addition, Pavtube Video Converter Ultimate v4.9.0.0 and higher version supports NVIDIA HEVC and AVC encoding with GPU acceleration at up to 3x times video encoding speed which can save you lots of time. How to Transcode MKV for Streaming to Chromecast Ultra? Step 1: Load MKV files to the program. Download Pavtube Video Converter Ultimate. Click the “File” button to locate and impor MKV files to the program. This powerful Video Converter also supports drag and drop function to import original video. Step 2. Choose Chromecast Ultra supported file format. 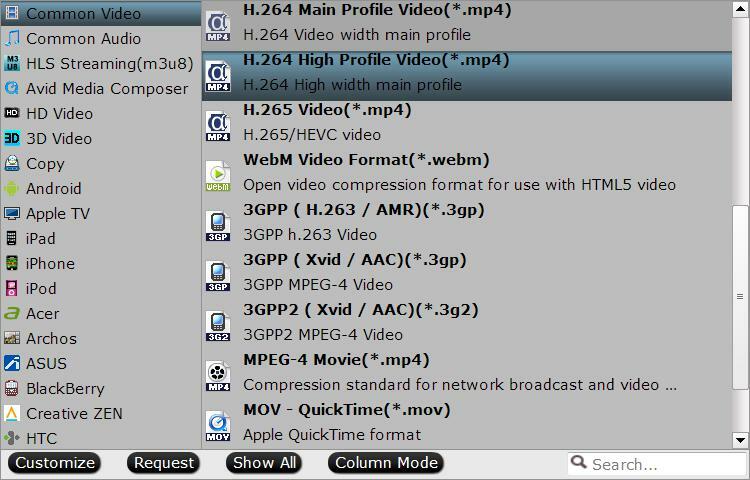 Click “Format” bar, from its drop-down options, choose to output Chromecast supported file format by following “Common Video” > “H.264 High Profile Video(*.mp4)”. Step 3: Choose Chromecast Ultra supported audio codec. Click “Settings” to open “Profile” settings window, under “Audio” section, click “codec” drop-down list, select aac or mp3 as the proper audio codec for Chromecast. Since Chromecast Ultra supports 4K resolution. So you can tap 3840×2160 to Video Size box. Go back to the main interface, hit right-bottom “Convert” button to begin the conversion from MKV to Chromecast Ultra supported MP4 conversion process. Then you can stream 4K video with Chromecast Ultra on your 4K TV (Samsung, LG, Sony, Panasonic, Vizio, Sharp, Philips, etc). Here you also can choose use Plex to stream video to Chromecast Ultra without transcoding video. 2. Install the Google Cast extension in Chrome. 3. Open Plex Web App. 4. Click on the Plex Players icon on at the top right. 5. 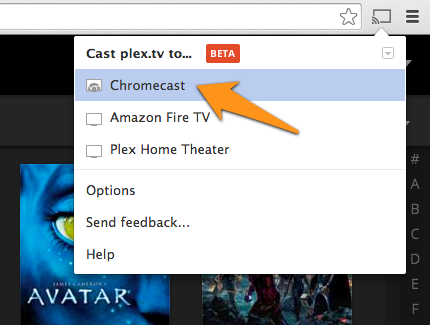 You’ll see the Google Cast extension window open with a list of the detected Plex Apps that are available. You should see the Chromecast Ultra available in the list. Select the Chromecast. This will set the Chromecast Ultra as the device on which you want content played. 6. With the Chromecast selected, you can use the interface as normal. When you choose to play something, it will play on the Chromecast instead of in the browser window. As you browse content in the browser, details about that content will be mirrored and displayed on Chromecast for everyone to see.